Approximately 97 percent of the fresh water available in the world is underground. Wells provide groundwater for individual domestic needs, communities, cities, industry, crop irrigation, and agriculture. Some wells tap hot water, or geothermal resources. In other cases, groundwater is used solely for its cooling capabilities. Some wells are dug solely to study water quality or quantity: these are called monitoring wells or observation wells. Regardless of its purpose, a well is defined as an artificial hole in the land surface created to access a liquid. It normally has a small diameter, typically less than 3 meters (10 feet), and usually measured in centimeters (inches). Wells may be constructed to seek water, oil, or natural gas. This article focuses on water wells and their construction. The top portion of a well is commonly called the wellhead. The appearance of the wellhead varies depending on its purpose, when and how it was constructed, and what materials were available when it was built. A hand-dug well may look like the nursery rhyme well in Jack and Jill—a deep hole surrounded by a stone wall. Most wells however, appear as a pipe, usually 5 to 25 centimeters (2 to 10 inches) in diameter, sticking up a short distance above the ground, typically less than 60 centimeters (2 feet). In cold climates, the wellhead may be covered by a wellhouse or pumphouse to help minimize potential damage from freezing weather. When a well is constructed in an area where an above-ground structure would create a problem, such as in a road, the wellhead may be in a vault. The vault usually has a strong cement floor, with a drain, cement walls, and a steel top. 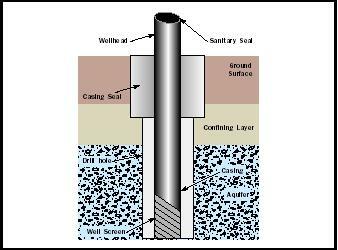 The typical components of a well include the sanitary seal, casing, casing seal, well screen, and the pump (see the figure below). The sanitary seal is the top covering of a well. Its function is to keep insects, small animals, dirt and debris from entering the well and contaminating the aquifer . This cap usually has an access port that allows periodic water-level measurements, and may have a screened breathing tube to allow air pressure to equalize as water levels rise and fall in the well. casing usually extends 30 centimeters (1 foot) or more above the land surface. In formations prone to collapsing, such as in sands and gravel, the casing may extend the entire depth of the well. Where the well is constructed in hard formations such as shale or basalt, only the very top portion of the well may be cased. Even in ideal circumstances, a 5.5-meter-long (18-footlong) long casing generally is considered the minimum. The casing seal is an impervious barrier, usually of cement grout or clay, placed between the well casing and the native material. It prevents surface water and undesirable groundwater from other aquifers from entering the wellbore or from flowing down the outside of the casing and degrading deeper water. Where wells penetrate confining layers at greater depths, seals are commonly constructed at least 1.5 meters (5 feet) into a confining layer. Occasionally, seals are also constructed at greater depths between different aquifers. These seals prevent one aquifer from draining into another, potentially resulting in resource loss or degradation. Screens in the casing are used to filter out sand and gravel while allowing maximum water flow into the well. Their construction varies from highly engineered screens over 15 meters (50 feet) long, to a few holes punched through the casing. The formations encountered in drilling and the intended use of the well indicate the type of screen, if any, that is needed. While some wells may flow at land surface under artesian pressure, most require some type of pumping mechanism to lift the water. Almost all of the common well pumps are centrifugal in design, using spiral impellers to push or pull water up and out of the well. The most common of these is the above-ground centrifugal, where the motor and pump sit at or near the well. These pumps are capable of moving large volumes of water, but they cannot typically lift from depths greater that 8 meters (25 feet). Wells with deeper static water levels and relatively low discharge requirements, such as domestic wells, often use submersible pumps. These pumps usually are attached directly above the motor and the entire unit is suspended in the well. Wells with deep water levels used for large quantities of water often use turbine pumps. Turbine pumps have the motors sitting on top of the well with a long shaft turning the impellers deep below the surface. One of the first things to decide is where to place the well. Assuming that an aquifer has been found at depth, the important considerations include maximizing distances to potential contaminants, access for machinery and potential future uses of the property. Septic systems, waste disposal lines, animal feedlots and buried fuel tanks all have the potential to degrade groundwater quality. Wells should always be at least 1.5 meters (5 feet) from any building site, in an area where future access can be preserved when repair, alteration or abandonment become necessary. There are many ways to construct a satisfactory well. The intended use and local geology usually dictate which methods will work in a specific area. Some of the common construction methods include digging, driving, and drilling. A worker reacts as water surges from a valve as a water well is activated in 1999 in Tekoa, West Bank. The well was the first to be owned and operated by the Palestinian Water Authority on the West Bank, and was financed by the U.S. Agency for International Development. The water was earmarked for the Bethlehem and Hebron areas. are inexpensive, but are restricted to the near-surface, which may be insufficient to provide ample water quantity of suitable quality. A driven well typically consists of steel point attached to a section of perforated pipe or stiff screen, and sections of solid pipe. After digging or auguring an oversized hole to later accommodate the seal, the well constructor drives the assembly into the earth until the screen or perforations penetrate an aquifer; then he pours the seal. Most wells are constructed with well-drilling equipment. The two main types of drilling machines are the cable tool and the rotary drill. The cable tool uses a heavy string of tools (bits), dropped repeatedly over the same point, to loosen, fracture and pulverize the earth so that it may then be lifted out of the hole with a bailing bucket. The loosened material and pulverized materials are referred to as drill cuttings. In dry formations, water may be added to the hole to hold the cuttings in suspension so they may be more easily lifted. The bailing bucket is a long cylinder, fitted with a one-way valve at the bottom. The bucket is lowered into the hole, then lifted and drained as the hole is advanced. Rotary drills use hardened drill bits to cut through the earth. Compressed air, water, or special water-based fluid called drilling mud is used to suspend the cuttings and lift them from the hole. This mud is usually forced down the inside of the drillstem, past the drillbit, where it picks up the cuttings, then up the outside of this drillstem to the land surface. The drilling mud also helps hold the hole open and forms a cake or barrier inside the hole so the fluid and cuttings are forced up the hole rather than into the formation. Regardless of which method is used, care must always be exercised in constructing the casing seal. Improperly sealed wells can contaminate water over a wide area. To construct the casing seal, the well constructor creates an oversized hole down to the intended sealing depth. The casing then is inserted, and the annulus (the space between the casing and earth) is filled with the sealing material. Where the formation is prone to caving, another temporary casing may be necessary to hold the hole open while the seal is constructed. If the sealing depth is shallow (less than 18 meters [50 feet]) and there is little standing water in the sealing area, a special type of clay, known as Bentonite ® , may be used as the sealing material. Dry Bentonite ® chips or pellets are slowly poured into the annular space between the casing and the natural formation. The other common sealing material is cement grout, which is similar to concrete without the gravel component. This fine-grained cement is pumped into the bottom of the annulus until it reaches the land surface. Once the well is drilled and the physical components have been constructed, the well must be developed. The purpose of developing the well is to maximize its discharge capacity. This usually is done by alternately pumping the well and surging water in the bore to wash silt and sand from the formation and open it to greater flow rates. A properly developed well will produce adequate quantities of sand and mud-free water. After completion of construction, a well test is performed to determine the capacity of the well to yield water over time. This can be done with a pump, a bailer bucket, or by blowing compressed air into the well bore. A component of this test is the monitoring of the well's drawdown. Drawdown is the change in water level in the well due to pumping. * A 1-hour test is considered the minimum period necessary to evaluate a well, with 4-hour and 24-hour tests being more reliable. This information is necessary to determine the usefulness of the well for its desired purpose and the size of pump it can support. The well construction process will invariably introduce bacteria into the wellbore. Once construction is completed, the casing, wellbore, and the standing water in the well are sterilized, usually with chlorine or hypochlorate solution. Once the disinfectant has had sufficient opportunity to sterilize the well, the well is purged, and the fresh water usually is tested for biological and chemical purity. During construction, development and testing of the well, it is very important that the constructor record every detail about formations encountered, water-bearing zones, construction components, and well yield. This record is called the water-well report or well log. It is extremely useful if the well ever needs repair or is to be abandoned. It also provides valuable information to the landowner, other well drillers, and resource managers. Over time, old and improperly constructed wells will deteriorate. The landowner is responsible for any wells on his or her property. Wells with faulty seals or that are commingling aquifers may deplete or contaminate the resource. Depending on the original construction methods and materials used, a defective well may be repaired by a skilled well constructor. In many cases, it is easier and cheaper to permanently abandon a defective well than to repair it. Permanent abandonment typically involves removing the existing casing, cleaning out the hole, and completely filling it with cement grout. In situations where the casing can not be removed, the casing must be perforated so the cement grout can penetrate into the formations and prevent any vertical movement of water in the wellbore. A water well is much more than a hole in the ground. To prevent groundwater contamination, a well constructor must use proper methods and equipment. Licensed and bonded water-well constructors have the equipment, knowledge, and experience required for proper well construction. For this reason, most states discourage landowners from drilling a well themselves. If a landowner decides to drill, alter, or abandon a well on his own property, he should first consult with the local regulating authorities to become familiar with specific construction requirement for the area. SEE ALSO Aquifer Characteristics ; Geothermal Energy ; Groundwater ; Groundwater Supplies, Exploration for ; Pumps, Modern . Drinking Water Program. Oregon Department of Human Services: Public Health Services. <http://www.ohd.hr.state.or.us/dwp/welcome.htm> . Educating and Motivating People to Care for and about Groundwater. The Groundwater Foundation. <http://www.groundwater.org/> . Featured Sites. State of Oregon: Water Resources Department. <http://www.wrd.state.or.us/> . Oregon Drinking Water U.S. Environmental Protection Agency. <http://www.epa.gov/OGWDW/dwinfo/or.htm> . The Oregon Well Water Program: Protecting the Groundwater that Provides Our Drinking Water through Education. Oregon State University. <http://wellwater.orst.edu> . Publications "A Consumer's Guide to Water Well Construction, Maintenance and Abandonment." State of Oregon Water Resources Department. <http://www.wrd.state.or.us/publication/wellcon99/index.shtml> . Groundwater quality changes with time. Hence, individuals with private wells as a source of drinking water should monitor their well-water quality on a periodic basis. At least once a year, the water should be tested for coliform bacteria and nitrate. Coliform bacteria are widespread in the surface environment but are not common in groundwater. Sources of nitrate include septic system effluent, lawn and garden fertilizers, and commercial fertilizer. Natural sources of nitrate in groundwater are few. The presence, therefore, of either coliform bacteria or nitrate in well water indicates that a pathway exists from the surface to the aquifer, and reveals that other contaminants may be present. Individuals should contact a local water testing laboratory to schedule testing. Usually these labs will prepare the sample bottles so that the well owner can collect his own samples, significantly reducing the cost. Local or state Health Departments can help the well owner interpret the test results, and can provide information about other contaminants that might be in the drinking water. Private well owners can significantly reduce the risk of contamination of their wells by ensuring that septic drainfields are at least 30 meters (100 feet) from the well, and that no chemicals are stored or misapplied in the vicinity of the wellhead. * See "Aquifer Characteristics" for diagrams showing drawdown and illustrating pump tests.